As I write this, vacation has officially started downstairs. Ursula and Virgil had only a half-day at school and got back home in daylight. Snow fell right on cue, big fluffy flakes that may finally cover the ground for good. I can hear the fire crackling in the fireplace, and Virgil whistling Christmas carols. This is the time of year when fires burn brightest — and they don’t all need to be inside. 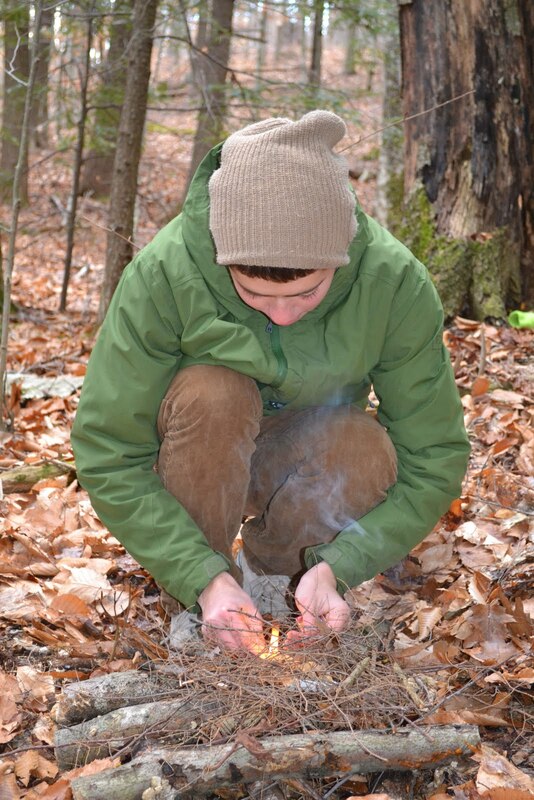 Some of our favorite winter outings have been built around fires. We walk into our woods until we find a pleasant spot for a fire; by now we have several favorites. The kids stamp out a level platform and set off in search of fire material. 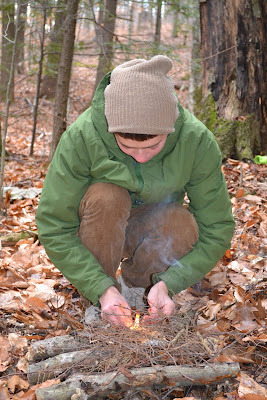 They’ve learned over the years that we need a good pile of small twigs, bark, and even needles to start the fire. If it’s snowing or the forest is wet, they know to whittle a piece of downed wood to create a pile of dry shavings. We also collect small branches. Jim tells the kids to look for branches that are no bigger around than a half dollar; in this situation, smaller denominations — dime- and quarter-size — are even better. We may build a small teepee of these sticks and branches over our starter pile, or we may feed them to the small flame once it’s lit. Often we create a lattice of larger logs to create good air flow through the fire, but only after the fire is well established do we add anything you might call a log. The purpose of our fires isn’t warmth, exactly — at least not a heat that would keep us warm through the night — but they warm us deeply in other ways. Talking recently to Alex DeLucia, AMC’s Leave No Trace coordinator, I learned that our winter fires are low-impact, as fires go. As anyone knows who’s walked by someone else’s fire ring in the backcountry, fires leave their marks, and those marks can last a very long time. Fires built on snow, and that don’t burn down to bare ground, leave little trace by comparison. Except, perhaps, in our memories. - Read detailed directions on how to build a fire on snow. Know the fire regulations for national forests and state parks. Wood fires are prohibited in many parts of the White Mountains.